In Chinese society, red lanterns were once associated with brothels as a fetish of sexuality and selling of one's body. The divided snapshots of the lanterns symbolize the divorce of the physical and the spiritual body of marginalized women. 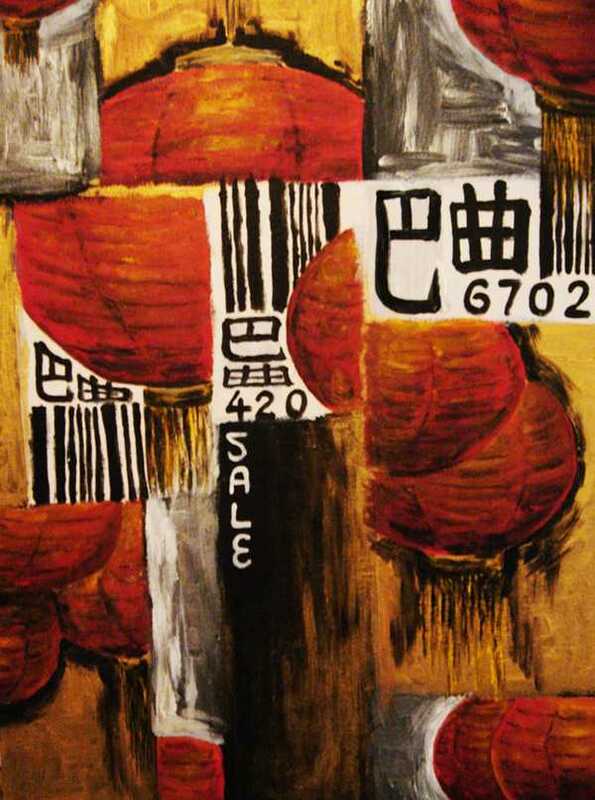 Featured along with a stylized barcode--so familiar in contemporary consumer society--the painting is meant to refer to the ways that women's bodies can be treated as commodities. In my paintings, installations and performance art, I explore the ideas of travel, transition and adaptation in different levels and spectrums – physically, temporally, culturally, linguistically, emotionally and spiritually. As I immigrated to the United States in my early adulthood, the experience of cultural shift and abrupt loss of the communities in which I had been actively engaged changed my view of self, root, and my relationship to those “other” worlds left behind. In my artwork, I am interested in contesting the psychological landscape and temporal shift affected by memory, history, as well as the cultural and built environments. I use references of mythologies, folk art productions, historical iconographies, as well as maps of reality and imagination in my art-making. The works I create often incorporate words, references of classical poems in calligraphy, and metallic colors to manifest the shimmering past.